Welcome to the July 2017 edition of the newsletter FERTINEWS! July 2017 was marked by an important event for the fertilizer sector in West Africa. Over 250 participants and experts from different countries convened in Accra, Ghana from July 10th to 12th to take part in this major event, organized by CRU Events and the African Fertilizer Agribusiness Partnership (AFAP). Discussions were focused on how farmers could obtain the right fertilizer, at the right time and for the right price. You will also find in this edition a link to the Ghana, Nigeria & Sierra Leone FTWG Workshop Report. Finally, the USAID-WAFP 5-year project is ending on July 31, 2017 and implementation of another USAID-funded regional fertilizer development project is being discussed. As always, we are delighted to serve you! Good reading! BENIN During the month of July 2017 fertilizer retail prices in Benin remained the same. However, the government during the ministry council of July 12 decided to decrease prices of old stocks of fertilizer. From the explanation given by the government, this provision aims to encourage the utilization of fertilizer especially Kcl on palms. In this case the retail price of old stock of Kcl is 6000 FCFA per 50 Kg bag. BURKINA FASO In Burkina Faso, agricultural activities continued in all regions but at different rates and stages due to the poor distribution of rainfall. As a consequence, movements in the fertilizer market have undergone this same disparate rhythm. Given the needs of producers, the subsidized fertilizer distributed was largely insufficient. However, AGRODIA, the national association of agricultural input distributors, reassured farmers about the availability of large quantities of commercial fertilizers. CÔTE D’IVOIRE The general trend of sales was up for urea, NPK 15-15-15 and NPK 12-22-22, and down for NPK 0-23-19. In the North, cereals and cotton animated the fertilizer market. Cereal producers were active in Retailers' warehouses for their annual needs, unlike cotton producers who were awaiting the distribution of their allocations by the professional agricultural organizations that have already been supplied by the cotton industries to which they are linked. In the South, East and South-West zone, producers were supplied with more fertilizer for cereals than for cocoa, whose fertilizer market slowed slightly. Retailers have all increased their turnover compared to last month because of the larger exchanges. GHANA Fertilizers were available to farmers, both compound NPK and nitrogenous fertilizer, Urea and Ammonium sulphate in the 216 districts across the country. The agro-dealers were satisfied with their sales as this month sales were better than last month. Prices remained unchanged compared to the previous month in relation to the commercial market. Farmers are to pay 57.50 GHS for NPK and 47.50 GHS for Urea under the 2017 subsidy program. MALI In Mali, fertilizer sales improved in June compared to the previous month. This is due to the early distribution of subsidized fertilizers by the government. Bond tickets, which are essential to acquire subsidized fertilizers, are still being distributed in the different sectors. Fertilizer selling prices were stable compared to the previous month in most areas. 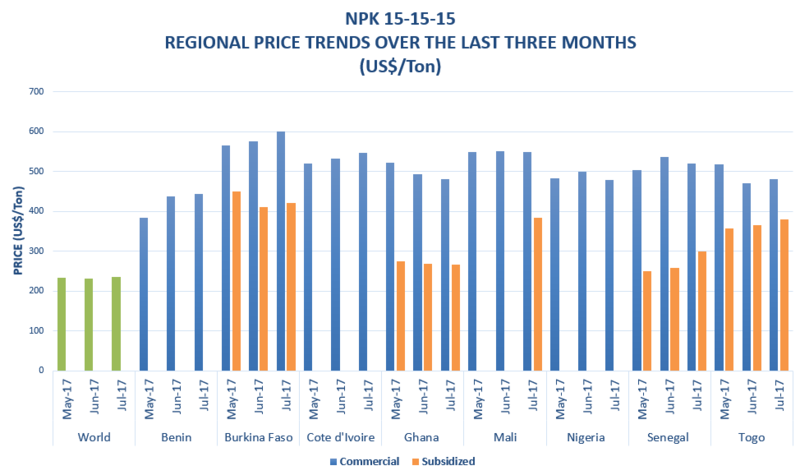 However, there were exceptions in SEGOU, SIKASSO, DIOILA, NIONO and KITA where commercial prices for urea, DAP and NPK 15 15 15 increased compared to the previous months. NIGERIA On the average, prices of Urea remained stable at 7500 NGN in the northern part of the country and 7000 NGN in the south at open market rates. Indorama took steps to bag the UREA delivered to the Presidential Fertilizer Initiative-PFI differently from the bags sold in the market to ensure blenders under the PFI do not sell in the open market as this distorts price. The PFI can access Urea at 4500 NGN while the open market gets UREA at 6000 NGN at factory rates. SENEGAL In Senegal, the onset of the rainy season has led producers to invest heavily in the planting of cereals and vegetables. As in previous years, there was a resumption of fertilizer sales at the end of June. The market should be even more dynamic during the month of July. Commercial fertilizers, particularly urea, NPK 10-10-20, NPK 6-20-10, NPK 15-15-15 and DAP are the best-selling. Retailers are restocking particularly with products from the Chemical Industries of Senegal (ICS) due to an omen of rising prices during the month of July.The distribution of fertilizers by the regional distribution commissions is still in progress. Most farmer organizations are still waiting to receive campaign funds for group purchases. TOGO The retail price of fertilizers in Togo during the month of July 2017 was the same as that of June. The Director of Mambo Commodities in July met with the Togolese Head of State in Lomé, after which he revealed the company's plans to increase its investment in fertilizer blending mainly for coffee, Cocoa and cotton. Nitrogen: Quiet market sees pressure building on prices: Holidays in the Muslim world contributed to one of the quieter weeks in the urea market. A few spot sales in Latin America accounted for most of the activity seen in the last week of June and low demand levels ensured that the outlook for prices remained bearish. Sales took place at lower prices as suppliers were more interested in looking for outlets for July cargoes. Mexican sales were covered by US re-exports, while South American business reflected the low-$180s/t fob Arabian Gulf. India made no moves towards floating a new tender for urea, as the government was fully occupied with the 1 July introduction of a new general sales tax across the country and the tender will be held in second half July. Phosphate: Indian phosphate producers begun to settle 2H 2017 phosphoric acid contracts with OCP, down $23/t P2O5 at $567/t P2O5 cfr. Major domestic DAP sellers began to increase their MRP of DAP effective 1st July due to the proposed hike in the GST to 12pc that was to come in to effect on 1 July. Indeed, there was considerable confusion as to the likely impact and indeed success of the GST's implementation/ It was observed that domestic producers had a distinct advantage over DAP importers due to the refund applicable as an input tax credit. Elsewhere, in Pakistan, United Agro was confirmed as having bought an early July loader from Quantum/IPL Australia above $360/t cfr. Chawla bought a DAP cargo from Quantum. West of Suez the market remained in stasis. Prices were stable-to-soft with demand non-existent. Indagro offered its Moroccan vessel at around $375/t cfr in Argentina. Brazilian MAP cfr levels were weak at $355-365/t cfr basis bids and offers. Overall, the outlook was for a continued softening of prices east and west of Suez. Potash: Eid festivities, a seasonally quiet period in Europe, and the expectation that China would settle its annual seaborne contracts in July caused a lull in the potash market. But demand for granular MOP in Brazil remained strong in June, and a raft of small tenders were expected to emerge when Indonesia and Malaysia returned to the market from 5 July. For the past five (5) years IFDC, through AfricaFertilizer.org initiative and USAID West Africa Fertilizer Program , has been working with the CountrySTAT program of Food and Agriculture Organization of the United Nations (FAO) to produce and disseminate, reliable and up-to-date official statistics on fertilizer manufactured, imported, exported and consumed in countries within the West Africa Sub-region. In 2012, fertilizer technical working groups (FTWG) were established in 11 Sub-Saharan Africa countries, including Ghana and Nigeria. These working groups have been responsible for the review of the data and the presentation of tables of results of these statistics which will be later validated by the National Technical Working Group before publication. For the first time, the validation workshop was held for not only Ghana and Nigeria but also included Sierra Leone. The Workshop took place at Blue Royal Hotel, Larteh-Ghana on 14 and 15 June 2017. CGIA SAS is the Authorized Retailer of CIPAM SA and SAPHYTO SA in Burkina Faso, based in Bobo Dioulasso. 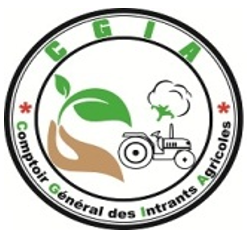 Created 3 years ago, CGIA SAS focuses on the marketing and wholesale, semi-wholesale and retail distribution of compound and simple fertilizers such as NPK, Urea, KCL and phytosanitary products and very soon seeds for the continuous development of Burkina Faso agriculture. CGIA SAS is also a member of the Regional Association of Fertilizer Professionals (WAFA). PO Box: 01 BP 1420 Bobo-Dioulasso Tel: +226 20 66 00 00. This video is an IFA Webinar made by Dr. Harold F. Reetz, Jr of Reets Agronomics, LLC on efficient use of fertilizers and its importance on sustainable agriculture productivity. USAID-WAFP: The United States Agency for International Development – West Africa Fertilizer Program’s Project (USAID-WAFP) is ending on July 31, 2017. The 5-year project was created to increase sustainable agricultural productivity through increased regional availability and use of low cost fertilizer. IFDC was the lead implementer, with additional technical support provided through the African Fertilizer and Agribusiness Partnership (AFAP), as well as local public and private sector institutions in the targeted countries. Implementation of another USAID-funded regional fertilizer development project is being discussed. This year’s AGRF is co-hosted with the government of Cote d’Ivoire and is being held for the first time in Francophone West Africa. An expected 750 delegates, sponsors and speakers including heads of state, development partners, academia, investors, business leaders will share their insights on how to align, create and leverage financial, technical, policy and market expanding resources to develop game-changing and inclusive agribusiness models for Africa to counter the major challenges facing the agriculture sector on the continent. The West Africa Fertilizer Program is a five-year USAID-funded project that seeks sustainably improved agricultural productivity through increased regional availability and use of quality and appropriate fertilizer in West Africa. AfricaFertilizer.org is a global initiative facilitating the exchange of information on soil fertility, fertilizers, and good agricultural practices in Africa.